Under construction: Cafe Peanut, 586 Newark Avenue, Journal Square, Jersey City. Photo by Chris Fry/Jersey Digs. 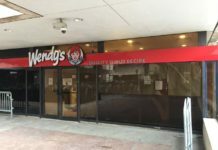 An eatery under construction at 586 Newark Avenue has taken grievances with their landlord across the street to the Hudson County Courthouse, claiming in legal filings that they can’t get a Certificate of Occupancy due to unfinished work at the property. Earlier this month, we reported on the mysterious Café Peanut near Journal Square. Little is known about the business, but the company is owned by Jersey City resident Ilir Mani. Lawyers for the café filed a lawsuit in Hudson County Court’s Chancery Division earlier this month against New Court Plaza LLC, the owners of 586 Newark Avenue. The bottom line of the lawsuit is that 10 months after executing the lease, Café Peanut says they still can’t open their doors and argues that New Court Plaza “knowingly misrepresented to [them] that the premises would be ready within 30 days of the execution of the lease.” The eatery claims to have paid $5,000 in rent every month since October last year and says they’ve expended $30,000 between rent and their security deposit. While the claims in the court filing are only allegations, it’s worth noting that there are two other storefronts at the 586 Newark Avenue property that also remain closed. Chinese eatery Ling Long Xuan has looked ready to open for months now, but still isn’t serving customers. The final retail spot at the property is home to signage for Exit Realty, but they too are not up and running. 586 Newark Avenue, Jersey City. Photo by Chris Fry/Jersey Digs. The landlord of the property is registered out of 665 Newark Avenue, Suite #409. A business named Jersey City Auto Transport is registered out of the same address but attempts to contact ownership through a phone number associated with that company have been unsuccessful. New Court Plaza LLC has not yet filed an answer in court to the allegations. However, the company did initiate a Landlord-Tenant claim against Café Peanut last month, alleging the company owed them over $16,000. The next court proceedings for the case are scheduled for April 12, as a motion has been filed to consolidate the dueling lawsuits. In the meantime, this retail stretch of Newark Avenue will likely remain dark for the foreseeable future as the legal process plays itself out.